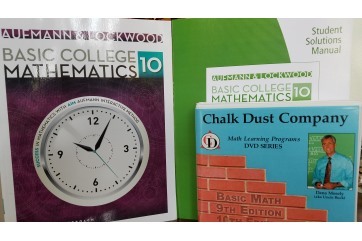 Basic Math 9th Edition Full Set is 9 DVDs, 9th ed. softbound text, 9th ed. student solutions guide, and student technical support. Student solutions guide supports odd Exercise problems with step-by-step solutions. The Chapter Review, Chapter Test, and Cumulative Review problems are fully supported for both even and odd problems. Chapters 1-9 are on grade level at grade 6, and Chapters 10-12 are advanced for Grade 6. This program includes hundreds of application problems that the student will enjoy. Disc 1 - 2 hours 53 min. Disc 2 - 2 hours 28 min. Disc 3 - 2 hours 30 min. Disc 4 - 3 hours 9 min. Disc 5 - 2 hours 36 min. Disc 6 - 2 hours 38 min. Disc 7 - 1 hour 52 min. Disc 8 - 2 hours 3 min. Disc 9 - 2 hours 1 min.